Group booking subject to a small deposit for damage and lost keys. Nestled in the heart of Kilkenny City, you will find all the city has to offer at your doorstep. Reception at Kilkenny City Hostel is open until 9pm but there will be an onsite manager in the hostel 24hrs. We also provide you with a light continental breakfast. We are situated 400m from the city's top attraction Kilkenny Castle and 500m from the world famous Smithwick's Brewery. Kilkenny is the Ireland of many visitors' imaginations. Built from dark-grey limestone flecked with fossil seashells, Kilkenny (from the Gaelic 'Cill Chainnigh', meaning the Church of St Canice) is also known as 'the marble city'. Its picturesque 'Medieval Mile' of narrow lanes and historic buildings strung between castle and cathedral along the bank of the River Nore is one of the southeast's biggest tourist draws. It's worth braving the crowds to soak up the atmosphere of one of Ireland's creative crucibles - Kilkenny is a centre for arts and crafts, and home to a host of fine restaurants, cafes, pubs and shops. 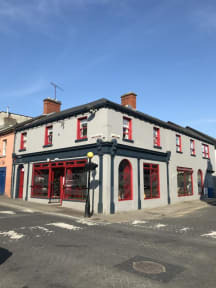 Kilkenny City Hostel is a 26 bed fully serviced, modern hostel and can facilitate individuals and large groups. Our rooms can sleep from 1-8 people. Each of our newly appointed rooms come complete with lockers, a private bathroom and shower. A light breakfast is included, Tea, Coffee, Toast, fresh fruit & treats daily !!! Reception open from 8:30am till 11pm. 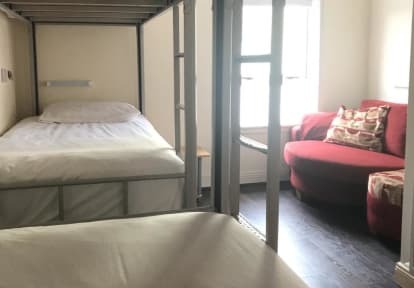 Kilkenny City Hostel is located in the city centre and close to the bus station, so it was convenient for me because I was travelling with two suitcases. The place is clean and renovated, but small: the entrance consists in a door between two shops, and the signboard of the hostel is not so evident. When I first arrived I found the door locked, but the manager arrived few minutes later. I asked him if I could pay by credit card, but I had to pay by cash.